That seems to be the logic behind dropping €347 million on Comptel, which has been involved in telecoms software for 30 years. 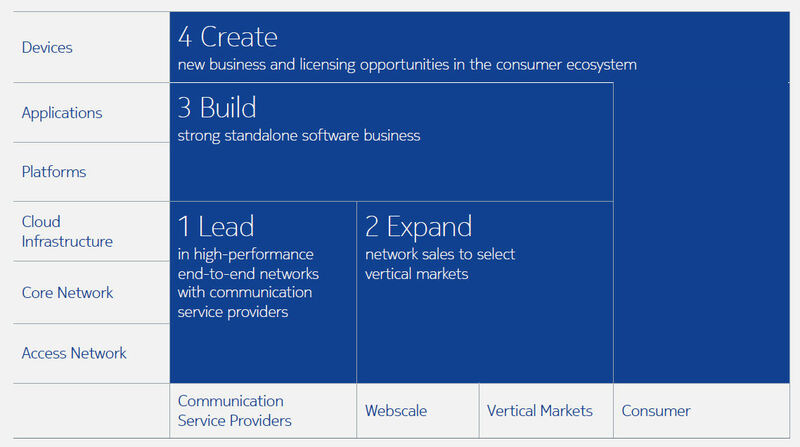 As Nokia detailed at its recent capital markets day diversification is vital in an era when operators are reluctant to spend in networking gear and a standalone software business was identified as the single most important direction to move towards (see slide below). According to the announcement Comptel brings ‘critical solutions for catalogue-driven service orchestration and fulfilment, intelligent data processing, customer engagement, and agile service monetization.’ Can’t argue with that. Ultimately NFV and SDN are the elephants in the room hosting any conversation about the future direction of telecoms vendors. Nokia and its competitors all want to be able to offer a one-stop-shop for the transition to virtualization and can only do so if they’re good at software. So it’s easy to see why Nokia wants to bolster its OSS capabilities as that’s the area of telecoms software concerned with making sure everything works. This move will put further pressure on Ericsson, which has its own OSS offerings and is under similar pressure to diversify away from networking gear, and is unlikely to be the last example of this type of telecoms software M&A we’ll see. Light Reading has further analysis on the move here and here. How ready is your organization to implement artificial intelligence solutions?